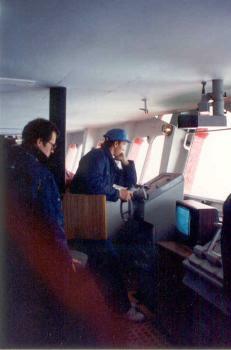 (Above left) After leaving the pole, the helmsman steers a course southward with a tiny wheel very unlike the massive helms of old sailing vessels. (Above middle) As the Yamal rides up on the ice pack and the weight of the ship presses down on it, huge cracks shoot out ahead of us. (Above right) Kapitan Dranitsyn is stuck again, and its Captain must be gnashing his teeth to see Yamal swinging casually around in a wide circle and breaking open the channel again. 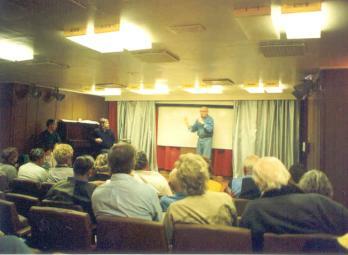 (Below left) Polar historian Bob Headland discusses the various vessels and aircraft that have reached the North Pole, sometimes reaching up to support himself against the ceiling. The 100-seat, slide-equipped lecture room is unlike any other, subject as it is to extreme shaking and the grinding noise of ice floes crashing against the hull. 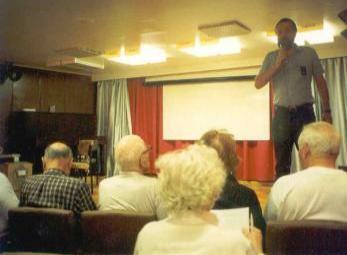 (Below right) Dr. Mikhail Grosswald of the Institute of Geography and the Russian Academy of Sciences, a shy but friendly man, lectures on one of his favorite subjects, the deep Arctic basin. 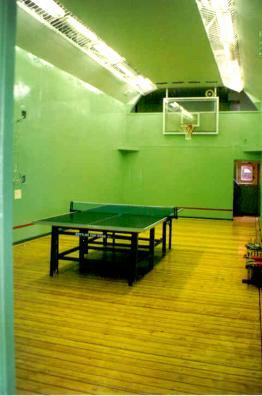 (L) Gymnasium, basketball court, table tennis room with treadmill and exercycle. 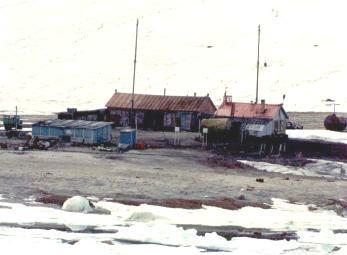 (R) Lounge well provided with books and other materials on polar subjects. 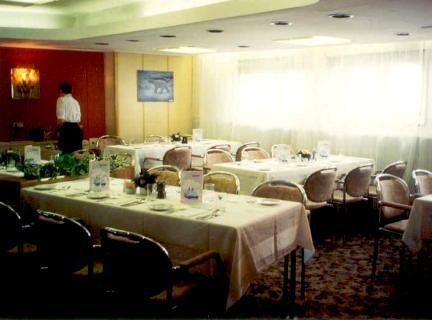 (L) Main dining room. 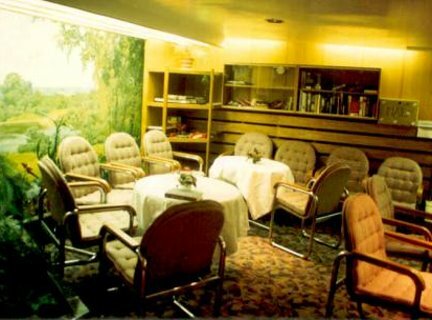 During normal ice operations this was the officer's dining room. 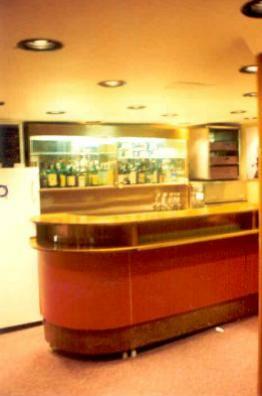 (R) The well-stocked bar was staffed by Dietmar, the Austrian bartender. 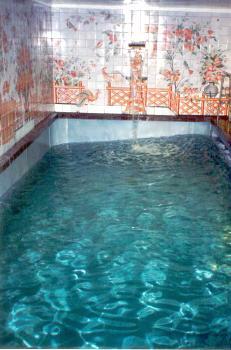 (L) Yamal's somewhat heated indoor saltwater swimming pool, occasionally subject to extreme sloshing and the noise of ice grinding along the hull immediately on the other side of the far wall. 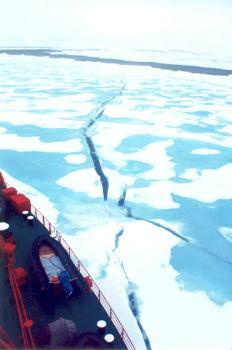 It was disconcerting to be in the water and feel the ship shudder and shake as it crashed through the ice. (Middle) The tag board. Every passenger on the ship had a tag that was white on one side and black on the other. 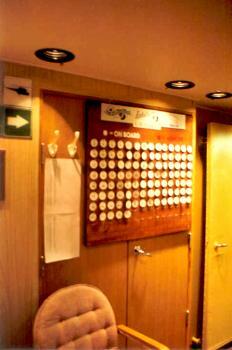 Whenever we left the ship, we turned our tag over to let the crew knew we were not on board. (R) While we are at dinner, our cabin attendant, Elena, turns down our beds and leaves a chocolate on the pillow! (Below) While the Austrian cooking staff cooked almost all meals for the passengers, one night the Russian cooking crew cooked a special dinner for us, and this was the menu. 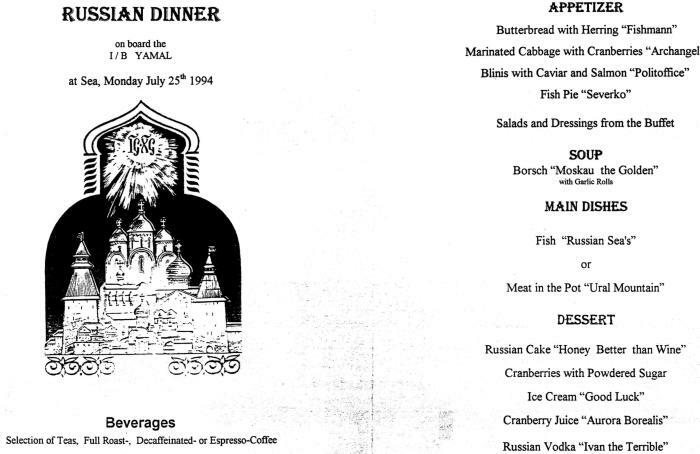 I particularly enjoyed the Meat in a Pot "Ural Mountain" and the Ice Cream "Good Luck," and of course the Russian Vodka "Ivan the Terrible." 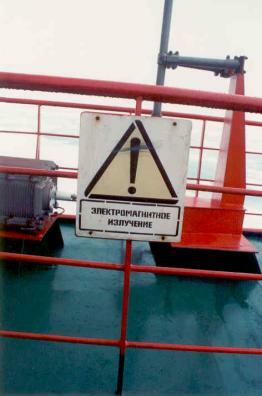 Signs for the Russian crew were all over the ship. I kept hoping that I was not reading one that said "Stay away! 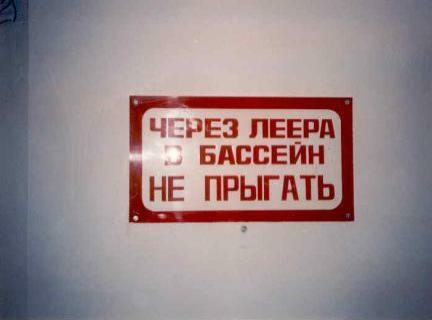 Radiation zone!" 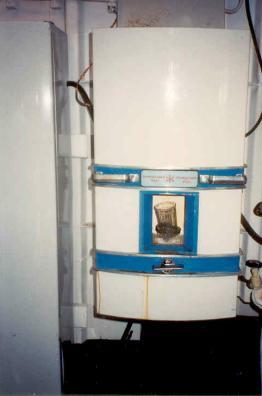 (R) One of those machines I had heard about that are quite common in Russia which dispense water for a kopeck in a glass that everyone uses. 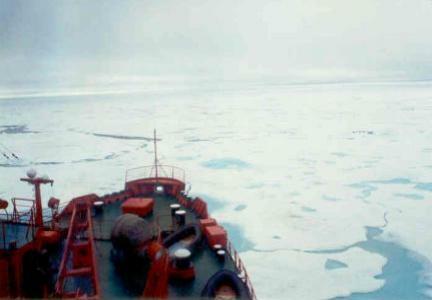 The Murmansk Shipping Company was founded in 1939. It leases the nuclear icebreakers from the Russian government, and contracts in turn to provide services of clearing ice from shipping lanes. 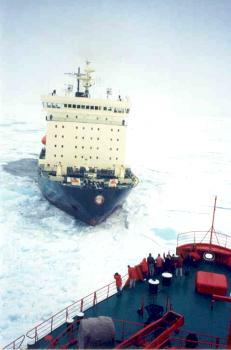 The shortest sea route between Europe and Japan is across the top of Siberia, but this route necessitates both icebreakers to open a channel and cargo ships with ice-strengthened hulls. This has been a very successful commercial shipping route. The Murmansk Shipping Company operates both the larger two-reactor icebreakers such as Yamal, single-reactor vessels, and diesel icebreakers like the Kapitan Dranitsyn. The Yamal is a working ship which spends the bulk of the year out in the ice, and it goes without saying that throughout the winter, there is 24-hour darkness. 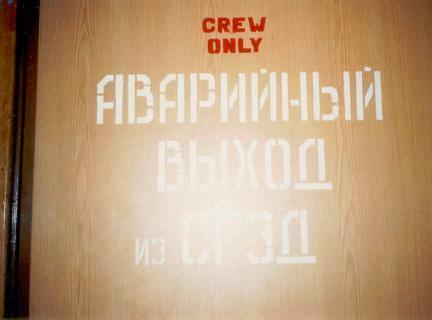 That is why the conditions are as good as they are on board Yamal, to keep the crew from going crazy. 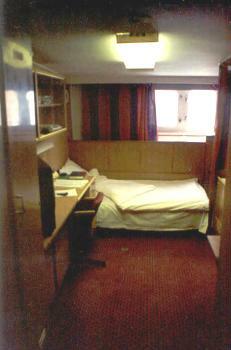 The Yamal was launched only two years before the cruise I sailed on, and it was absolutely state-of-the-art. The keel was laid in St. Petersburg. Inspection of the instrumentation on the bridge revealed both Soviet and American technology. We were told that the company wished to buy the ships outright, but I don't know whether progress has been made toward that goal. "Yamal" is a Nenets word meaning "End of the Earth," and it also refers to a peninsula near where the Ob River flows into the Arctic Ocean. 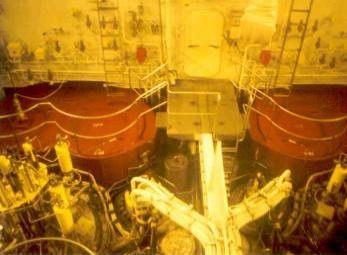 (L) Looking through the thick glass window into the nuclear reactor compartment. (R) Master Captain Boris Sokolov, Captain of the Lenin, the world's first nuclear icebreaker, and Senior Captain of the entire fleet, was invited by his former student and Lenin officer Andrei Smirnov, Yamal's Captain, to join us on our cruise to the North Pole. 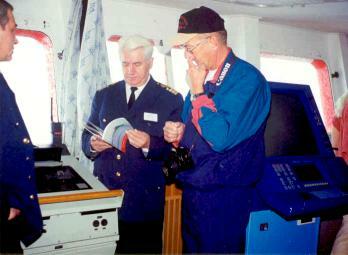 Here he explains something to Captain Smirnov on the left and the American doctor on board on the right. 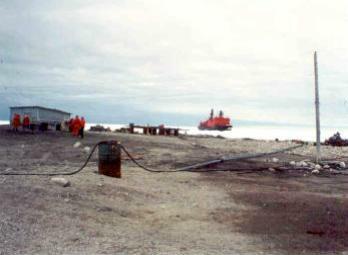 (Below left) Dranitsyn pulls up beside us so we can transfer some supplies to them. 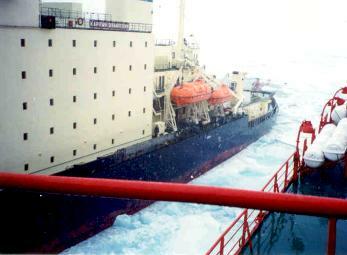 The white canisters on the deck of Yamal are life rafts. 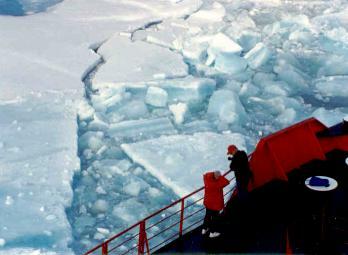 (Below right) Passengers observe what Yamal can do to thick ice. 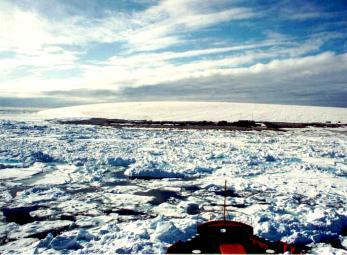 We are now cruising southward, this time toward an island situated at the western end of Franz Josef Land. 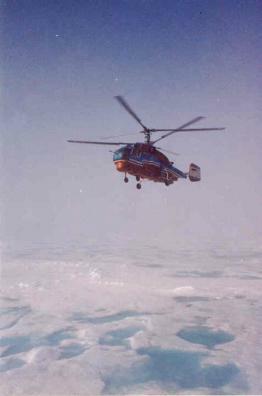 Beyond that we will head for Novaya Zemlya and a possible landing on the Siberian coast. (R) The big helicopter takes off to scout the way ahead. (Above left) Our first view of Victoria Island, mostly covered by a dome-shaped icecap. On the island and the object of our visit was an abandoned meteorological station. Dranitsyn, on its way north, had stopped and reported that there was bread and butter on a table in one of the buildings, and other evidence of fairly recent occupation, including a radio log from April of 1994. (Above right) We arrive offshore and fly in to land next to the station, where because of glacial meltwater runoff, the ground was very soggy and we were glad to have our waterproof boots. (Below left) The buildings were largely in disrepair and there was junk and litter all around. 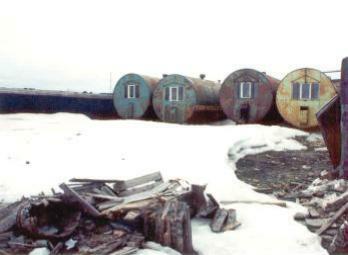 (Below right) Some of the prefab type of quarters utilized at this station.